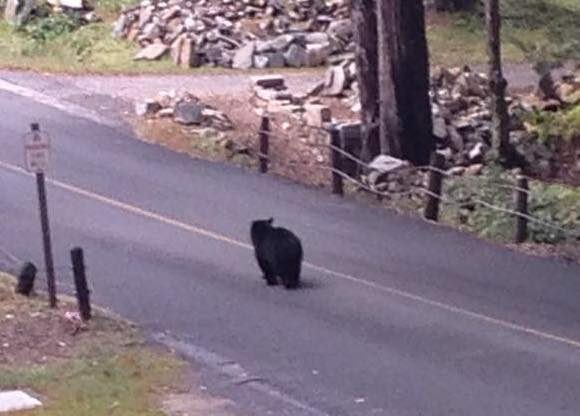 Photo of the black bear seen Friday in Hadlyme. Photo by J. Bjornberg. During the daytime hours on Friday, Emily Bjornberg, who lives on Brush Hill Rd. in Hadlyme, reports that her husband came upon a black bear attacking and subsequently killing a sheep on their property. The Connecticut Department of Energy and Environmental Protection (DEEP) has been informed and is monitoring the situation. –Black Bears are rarely aggressive towards humans. They should be respected, not feared. For more information on black bears, visit this link. Perhaps the DEEP should consider removing the bear. The bear’s aggression is disturbing. We have a lot of wonderful woodlands in the area but maybe difficult to enjoy if you have to constantly look over your shoulder for the purpose of safety. Unpredictable at best. I not a tree hugging hippie but I say let the bear be unless you plan on hunting it to eat it. I agree with David. Since the bear was also on my road in Lyme a few days ago, this new aggression IS disturbing. I love to sit outside, and now I cannot, looking over my shoulder; and now I even worry about getting out of my car to go into the house! I agree that the DEEP should consider removing the bear. Hey folks, I would like to respectfully suggest that we remember we share this beautiful rural town with our other animal neighbors. In my opinion, enjoying nature and woodlands means meeting the ecosystem where it’s at, and doing as little as possible to disturb it and it’s inhabitabts any further than we already have. Enjoying the forest does not mean tailoring it to be a completely safe environment just for humans. If we did this, it would cease to be a real forest and turn into something resembling an urban park or garden. Enjoying the forest means acting as a gracious visitor and taking the necessary precautions related to the forest, including tick checks, proper food storage, knowing appropriate behavior when encountering wildlife, etc. Let’s remember how many communities in this country live with a much more significant bear population, and the residents have learned to safely coexist with these very special parts of the ecosystem. I have encountered many black bears on hiking trips and, when treated with safety and respect, they are majestic and awe inspiring creatures. We have all chosen to live in a beautiful rural town presumably because of our shared reverence for nature. Let’s remember it’s not here for our benefit – we are a part of a greater whole. From the picture it appears it may be young. Someone who lives closely with black bears for a long time could possibly give insight? Does this mean a youngster is developing lifelong bad habits? Or is this a random act of desperation to put on winter fat by an inexperienced juvenile? I agree with Mari’s overall philosophy. The difference here is that the bear did attack and kill local livestock- not exactly a benign incident. I do think that it is reasonable to be concerned and ask questions. What does this behavior mean for possible future occurrences and encounters?